Fr. Alexander Golubov, gives a tour on the buildings history and architectural innovations. Former Academic Dean and Associate Professor of Pastoral Theology and Spirituality, Fr. Golobov attended Temple University (B.A. in English Literature), the University of Rochester (M.A. and Ph.D. in Russian Literature and Intellectual History) and St. Petersburg Theological Seminary and Academy (Pastoral and Theological Formation). Author of more than 20 published articles, including “Spirituality in the Orthodox Context,” the Foreword of Dumitru Staniloae’s Orthodox Spirituality, he has contributed to Sourozh (“The Rags of Morality: Original Sin and Human Nature”) and Pravoslavnaia Entsyklopediia (articles on the Alaskan Diocese and Bishop Amphilochius, in Russian). He has also spoken at various conferences, including “Issues of Religion and Identity in Russian History and Culture” at Boston Theological Institute/Holy Cross Greek Orthodox School of Theology and “The Struggle for Ecclesiology” at the Davis Center at Harvard University. 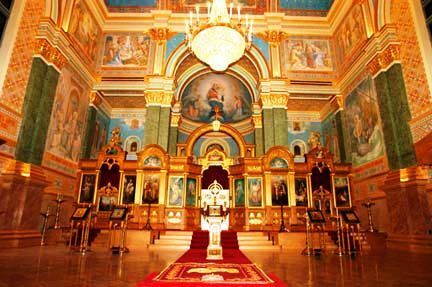 Most recently, he lectured at the 28th annual Yale-Hopkins Summer Seminar at Yale University on the topic “Understanding Medvedev’s Russia: the Orthodox Church.” St. Nicholas Cathedral, The first Orthodox parish in New York, on the eastern coast of North America, dates back to 1870.